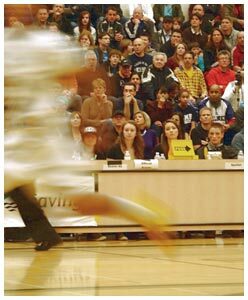 College recruiting for basketball talent is growing rapidly and is very competitive. Today talented athletes have a chance to be exposed to colleges if they start early and go through the process methodically. As a coach, I see the importance of helping students who are interested in getting exposed to colleges. This opportunity becomes more and more critical the closer the player is to graduating. The earlier you start the process, the more you can prepare to position yourself to be recruited. To help players get recruiting, I have developed a program that will prepare you in different areas, expose you to colleges, and market you to targeted colleges. Find out more about our program and start as early as possible building the profile and skills that colleges and coaches are seeking in recruiting candidates. This program starts at the 8th grade level. Complete the form below and Coach White will get back to you! Take this questionnaire and assess where you are in your qualification process. We will provide you with a plan on how you rank and what you need to be focusing on to become recruitable .